Home - Plasti-Sleeve - The original in post frame protection! Homework Design Inc., after over a decade building residential and commercial projects, has evolved into a manufacturer and supplier of innovative construction components for Post Frame Design. Our construction background leads to design with insight. That insight lead to the initial invention, patent, and manufacture of PLASTI-SLEEVE in 1994…we were the first and "Original" in post protection. Our desire to be the leader in innovative Post Frame building products has continued with Plasti-Skirt (Skirt/Grade board protector) and Short-Sleeve. Quality in our products and integrity in business is the foundation from which we build on. 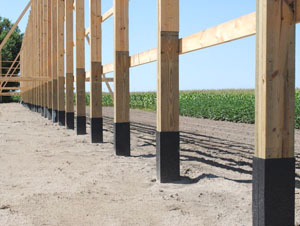 The FootingPad is a composite footing system designed to replace concrete footings. It is durable, strong, and lightweight. See more information on our FootingPad page. Plasti-Sleeve Post Protection available in 22 specialized sizes! See specs on Plasti-Sleeve page. See us at the annual NFBA show each year. Plasti-Skirt now available in versatile 100 rolls – Skirt board protection! Special sizes available for OTP nail-lam and Titan glu-lam columns. Ask about our nice stands for your showroom displays. Plasti-Shim, a simple flat spacer shim made from polyethylene plastic. Will not split, swell, or deteriorate like wood. Handy for so many jobs: construction, home, shop, farm, auto, marine. Unlimited uses!